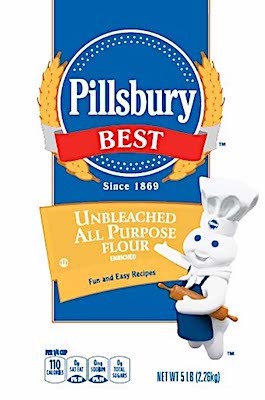 According to the FDA, Hometown Food Company has recalled two specific lot codes, consisting of an estimated 12,245 cases, of its Pillsbury branded Unbleached All-Purpose five (5) pound bags of Flour due to suspected Salmonella contamination. The recalled Flour products were distributed through a limited number of retailers and distributors US nationwide. If you believe you have purchased or have in your possession any of the recalled Unbleached Flour products, please do not consume them directly nor use them as an ingredient in another dish or preparation. Instead, return the flour to the store where you purchased it for a full refund. ==> To see other recalls and notifications caused by contaminated, adulterated or mislabeled Unbleached Flour products, please search for “flour” or more generically, “baked goods” using the Search Box at the top of this page. ==> To see other recalls and notifications for products manufactured, marketed and/or sold by Hometown Food Company, please search for “Hometown Food” using the Search Box at the top of this page. ==> To see other recalls and notifications for products manufactured, marketed and/or sold under the Pillsbury brand name, please search for “Pillsbury” using the Search Box at the top of this page.